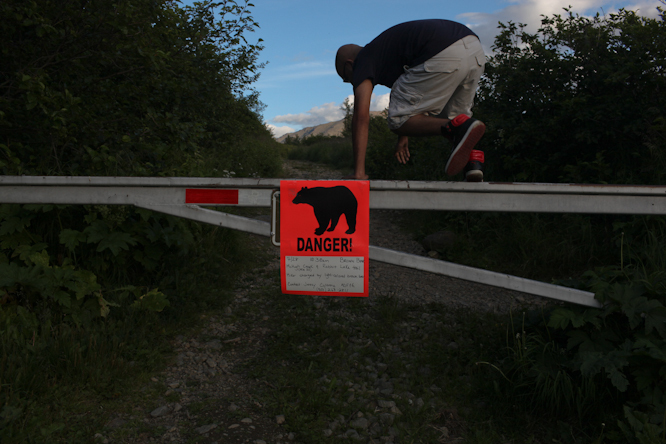 Day 0 - Anchorage, Alaska: Aman jumps a barricaded section of a park. The sign reads that a hiker was attacked by a bear earlier that morning. 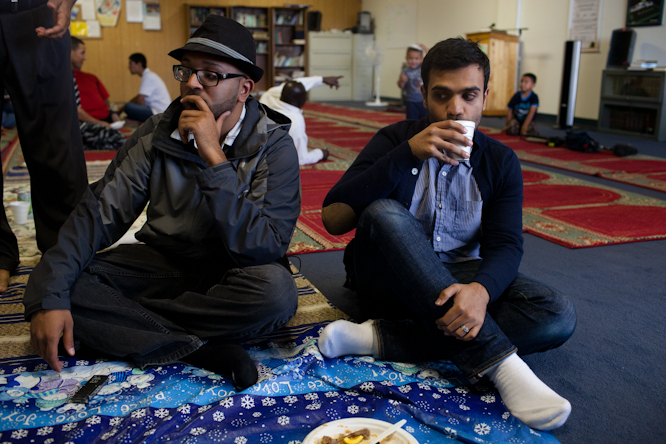 Day 1 - Anchorage, Alaska: Bassam (me) breaks fast with water while Aman waits patiently to break his fast following local time. 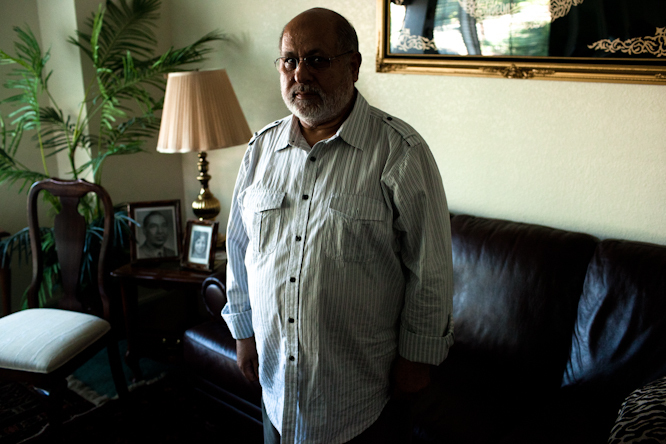 Day 1 - Anchorage, Alaska: Mohammad Obeidi somehow ended up as a cab driver in Anchorage in the early 1960's. He also sold paintings on the side. 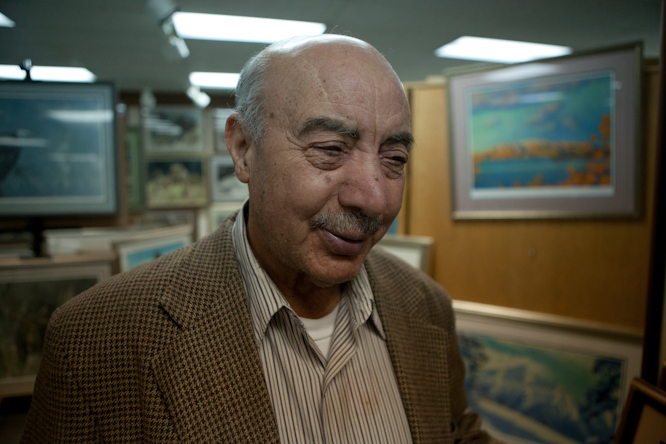 He now is one of the largest art collectors and art buyers of local Alaskan artists. 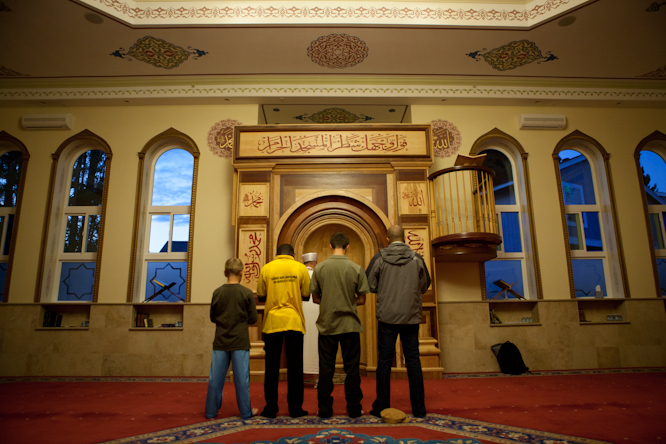 Day 2 - Seattle, Washington: Aman prays Maghrib (the sunset prayer) with a small congregation at a Bosnian mosque. 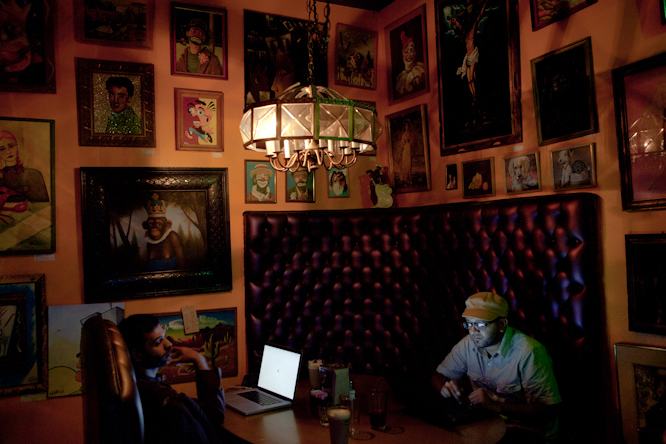 Day 2 - Seattle, Washington: Aman and I blog our second day posts sitting at a coffee shop turned bar after midnight. Day 3 - Portland, Oregaon: Aman relives his childhood dreams of becoming Wolverine at an uber-hip vintage store in the mecca of hipsters, Portland. 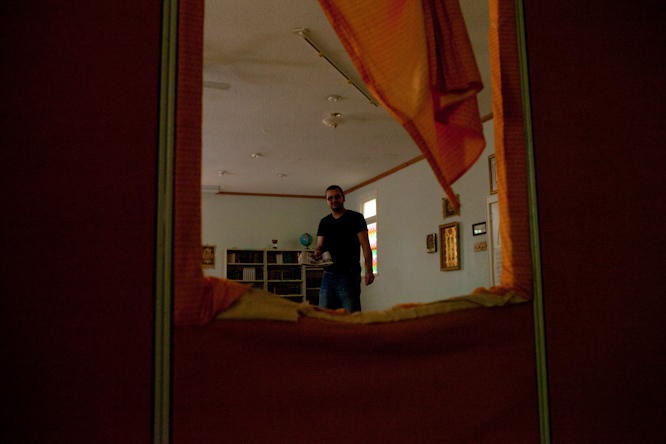 Day 3 - Corvallis, Washington: Ali Godil watches the congregation pray taraweeh, the night prayer during Ramadan, as he writes a note to MoMo, a friend who tried to bomb a Christmas tree in Portland. 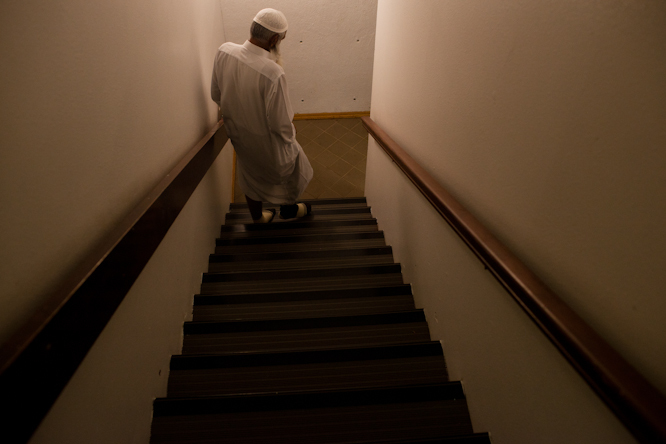 Day 3 - Corvallis, Washington: An uncle from the mosque takes his time going down the stairs. 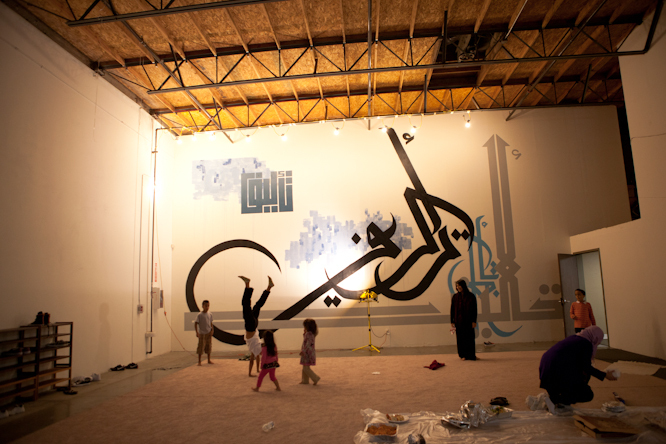 Day 4 - Freemont, California: Kids do handstand outside of the Ta'leef Collective's main room. 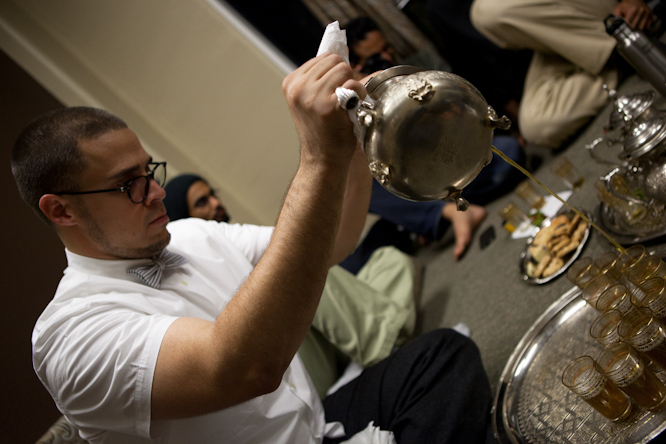 Day 4 - Freemont, California: Usama Canon, co-founder of Ta'leef Collective, pours a special blend of Moroccan tea with love. 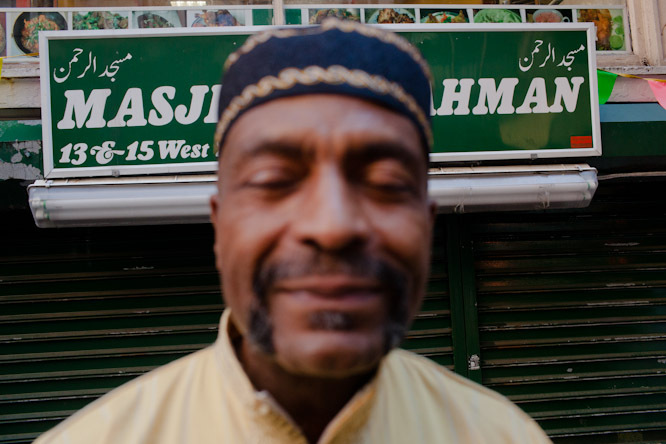 Day 6 - Las Vegas, Nevada: Amanullah poses for a picture after taking us through his journey from Afghanistan to America via photos. Day 7 - Laramie, Wyoming: Imad, a Libyan graduate student, leaves a generous break fast meal for us and runs back to his house to break fast with his wife and daughter. 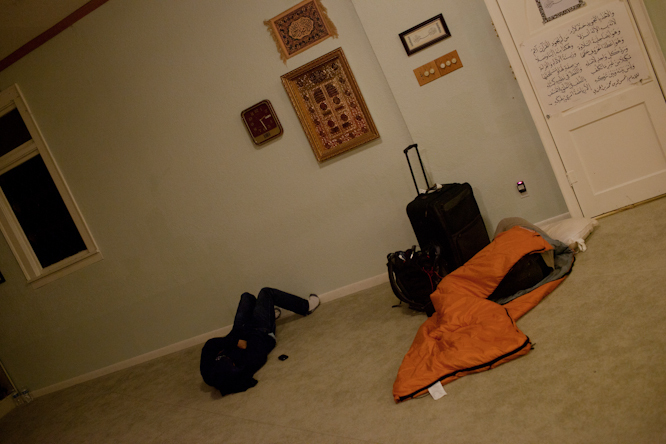 Day 7 - Laramie, Wyoming: Aman and a Jake Gyllenhaal look a like sleep in an empty mosque. 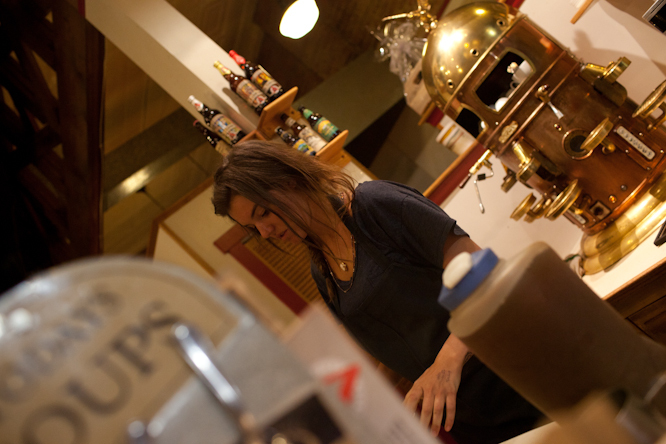 Day 7 - Laramie, Wyoming: The lone coffee shop open in Laramie til 11PM. 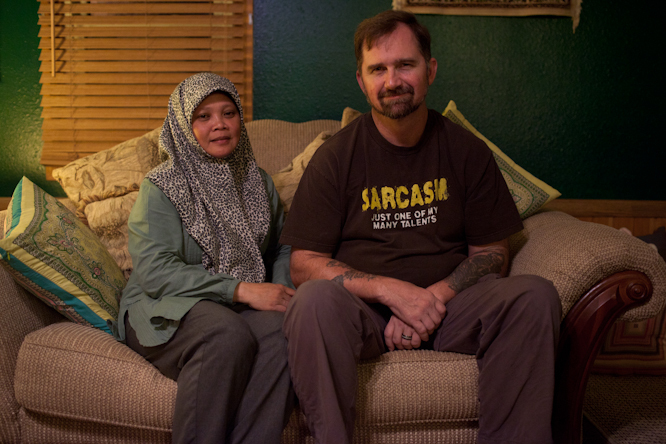 Day 8 - Sioux Falls, South Dakota: Nor and David sit together on their couch after sharing their letters written during David's time in prison. 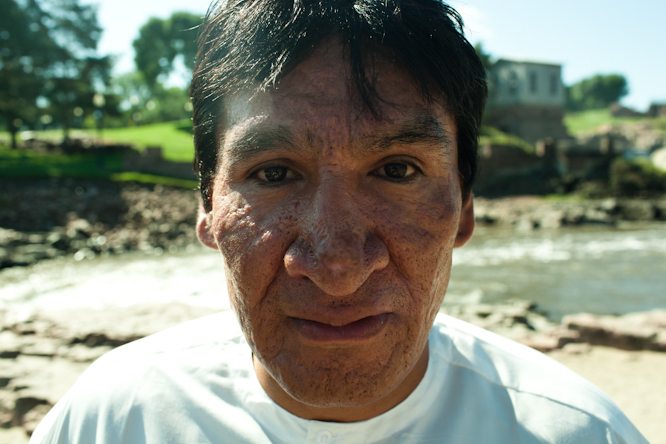 Day 8 - Sioux Falls, South Dakota: Basheer Butcher is a full-blooded Native American that converted to Islam in 2001. He hails from the Sioux tribe and grew up on the Cheyenne River Reservation in South Dakota. 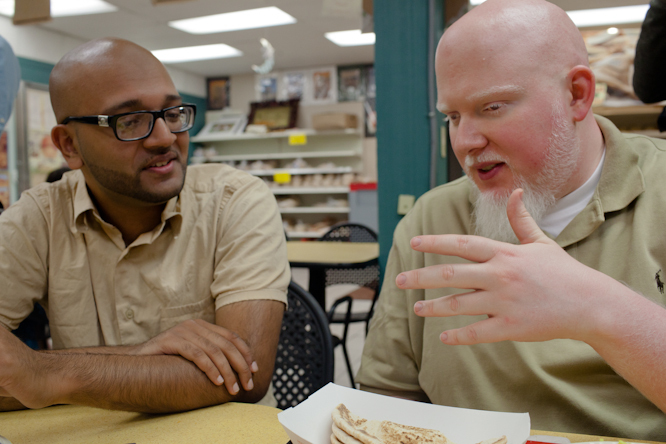 Day 9 - Minneapolis, Minnesota: Brother Ali shares a story with Aman over a break fast meal. Day 10 - Omaha, Nebraska: Marshall Taylor sits on the concrete that once was Malcolm X's birth home. Marshall and a close group of his friends have created a foundation that is working to create a cultural center in Omaha in his honor. 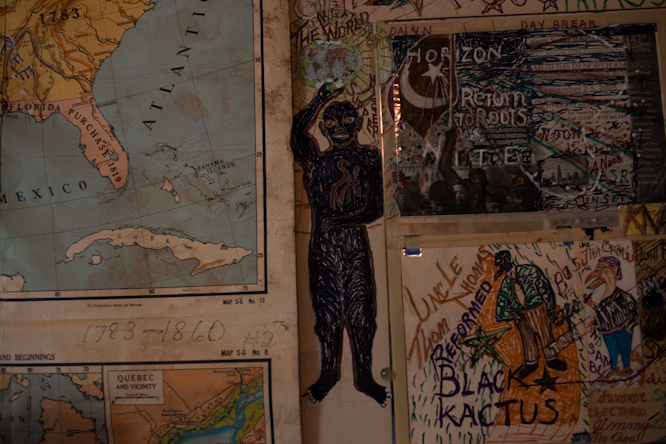 Day 10 - Omaha, Nebraska: The entire upstairs of Lutfullah's house is covered in vulgar scribbles and cryptic drawings that he has been making for the past five years. 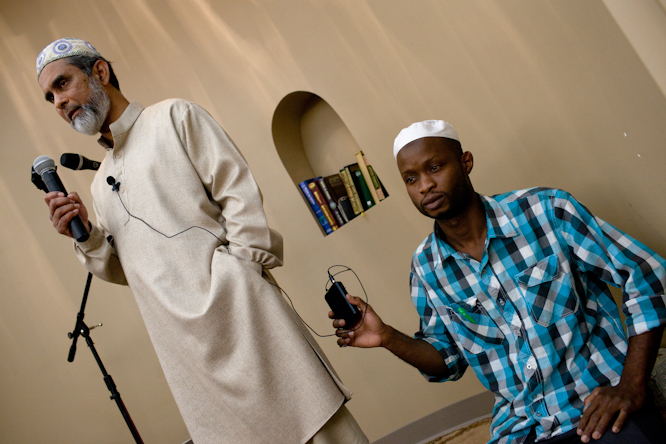 Day 10 - Omaha, Nebraska: Dr. Zia-ul Huq, an important figure of the Islamic Center of Omaha, makes an announcement about 30 mosques. A meta moment. Day 13 - Little Rock, Arkansas: A little girl stands in a long line for foodthat winds across the Women's area. 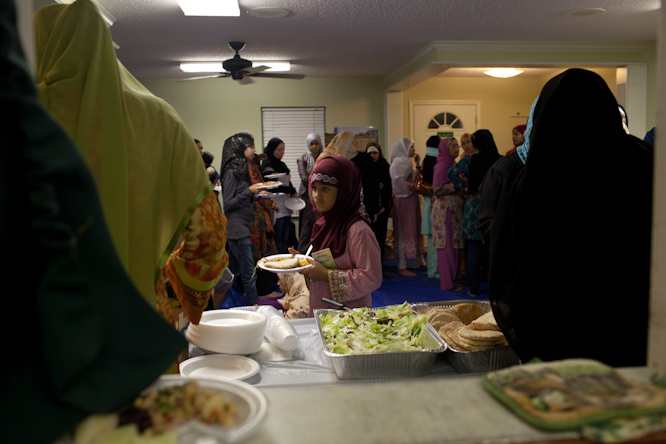 Day 15 - New Orleans, Louisiana: Syeed Ali, Aman's father, sits along other Muslims as they break their fast. Great post Bassam. It gives the reader a sense of how far you guys have gone. Love the new pictures! Halfway there. Mash’Allah, what wondeful photos! They really give us a sense of how Islam is practiced around America. Thank you so much for taking the time do do this project! Keep it up you guys!! 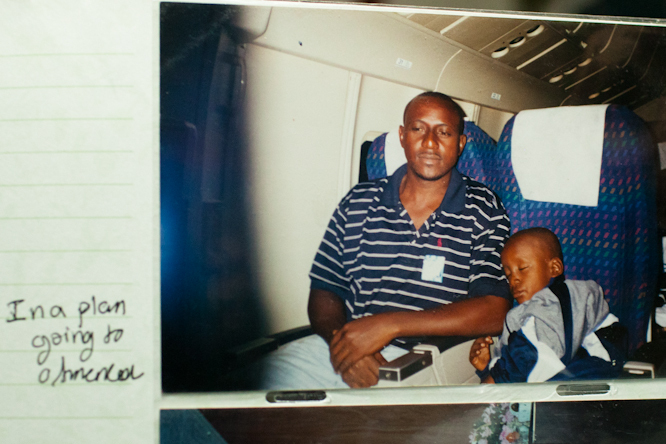 Photos look amazing, stories are crazy inspiring. Thank you. nice! 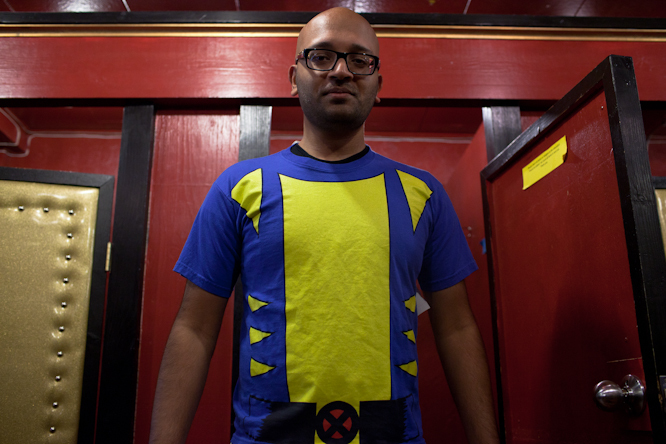 Extra Smedium wolverine shirt! Masya’Allah,what an amazing thing to do(: truly inspiring! may Allah bless your actions and keep you guys safe! We are now down to the last 10 days of Ramadhan,Insya’Allah, may all Muslims take the opp to make full use of wtv time is left to get closer to God.. and indeed,great photos taken(: peace be upon you. certainly my partner and i love all the coach!!! these are comfotorable and plushy m clothing!! profit them all sense of humor thin trousers t a polo t shirt !!!! my partner and i recomend the theifs to each and every gurl ! s do not be low cost buy them m these are durabule however, if you look after them!!!! !